When I first arrived at university, I would be lying to you if I said I never had a cooking disaster or two in the kitchen. I was lucky that when I lived at home, my parents were big on their cooking and made some beautiful dishes, but they made sure to teach me a trick or two before I flew the nest. At my student halls in my first year, my flat and I bought our food shop together and took turns to cook. Soon it became clear that I enjoyed cooking more than I first thought, and cooking for six people became a regular part of my week. Learning how to cook has been exciting, and I’ve taken it upon myself to experiment with spices and ingredients, especially since I became a vegan. 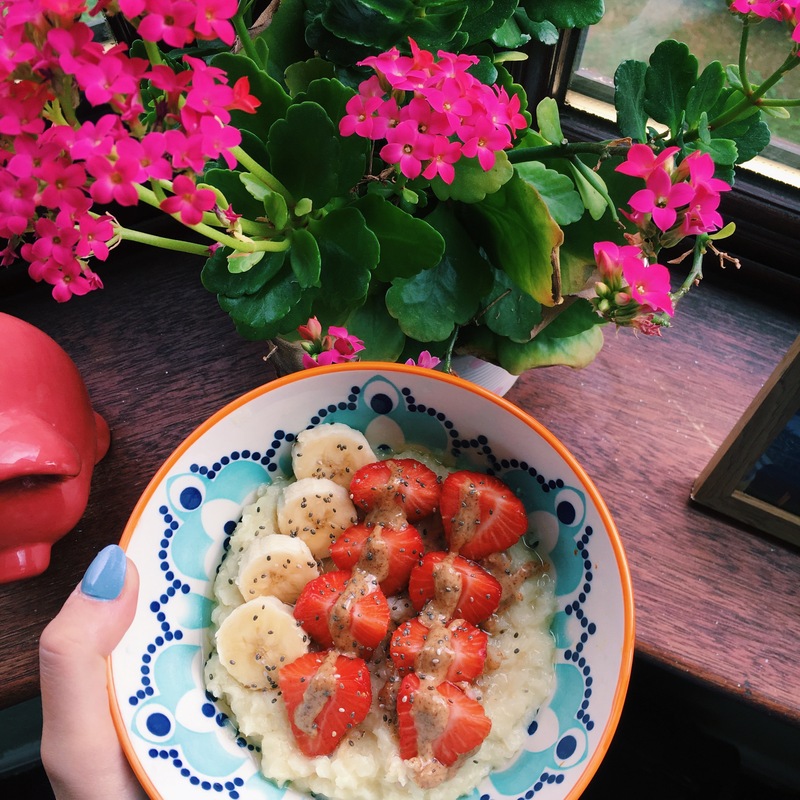 Here I’m going to share with you some of my favourite dishes I’ve been cooking up that are simple, tasty, and that you can actually make in your student house…I want to start with breakfast, because it is definitely my favourite meal of the day! A quick, tasty and healthy breakfast that will leave you with loads of energy for a hard day of studying. You’ll also be able to whip this up in a few minutes if you are short for time in the morning. Boil the rice flake porridge and milk according to the instructions, adding some syrup for a little sweetness. Once it is cooked, top with a handful of chopped strawberries and a chopped banana. To finish, drizzle over some almond butter and a sprinkle of chia seeds. This dish might take a bit more time (and a lot more washing up) but I guarantee it is worth it. 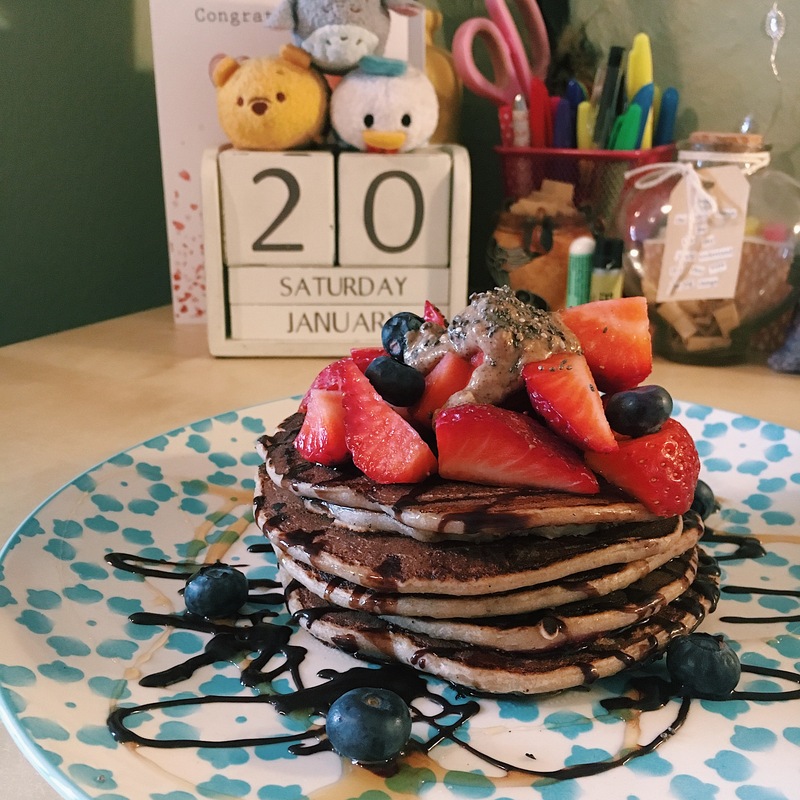 There are a lot of ways to make pancakes, and this is only one of them, so if it isn’t for you or you don’t have these ingredients, a simple search online will probably give you loads of other combinations to work with! Before you mix your batter, heat a non-stick frying pan until hot. Mix the dry ingredients, then whisk with the dairy-free milk and yoghurt. Add this batter to the pan in small portions – remember to flip at the right time! Once you have a desired amount of pancakes (you should have some spares for your flatmates, who might wonder what’s cooking) stack them up, drizzling over the syrup and chocolate sauce. Top with some fruit and a sprinkle of chia seeds to finish. 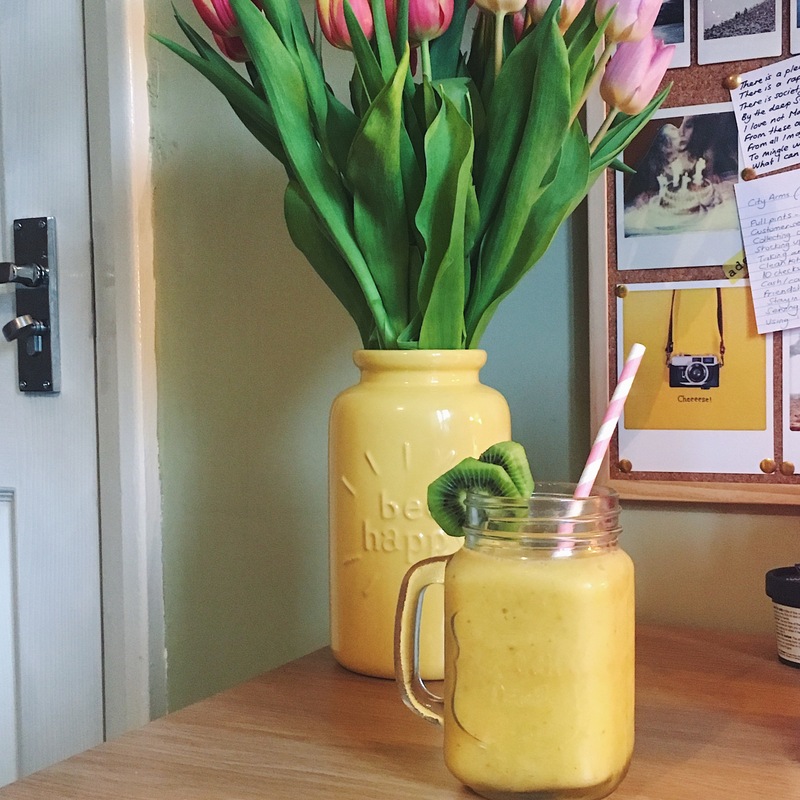 The best thing about a smoothie is you can’t really go wrong with them. Store some frozen fruit in your freezer and it is always there for when you feel like a pick-me-up! You can make this the night before, meaning you can have an extra 10 minutes snooze in bed…blend it up and serve in your favourite container. I also topped with some chopped kiwi and added a straw, for the purposes of the photo, of course. 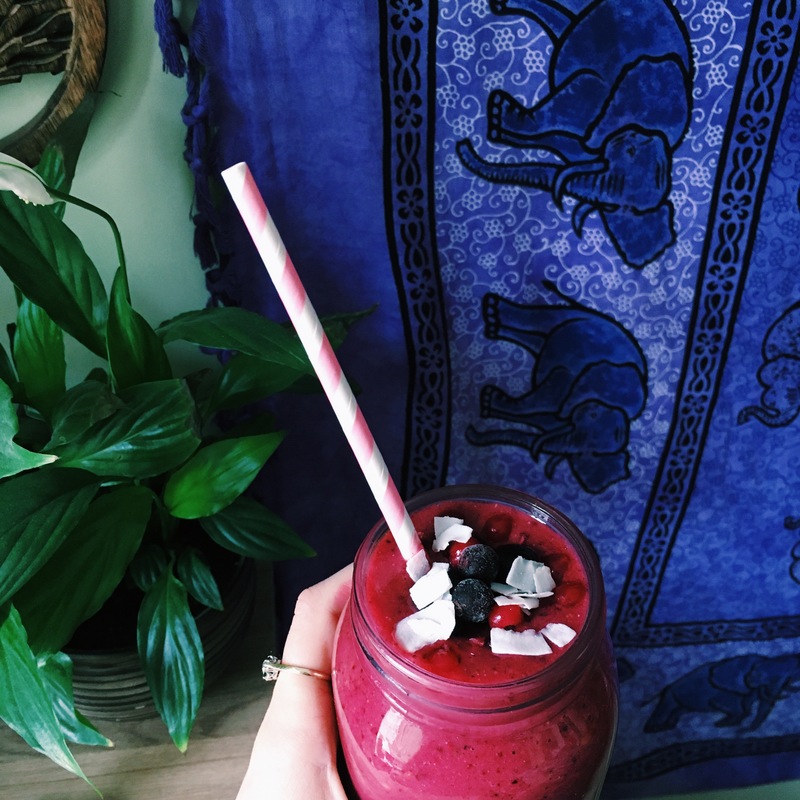 I love a good berry smoothie, and this one is no exception. Anything goes with this combination, so whatever berries take your fancy. They can be frozen or fresh, or fresh that have been frozen! Just make sure you have at least one frozen element to you recipe to make it extra cold. You can even add some frozen straight from the bag to the top for decoration. If you re-create any of these dishes, be sure to tag us in! Make sure to check out my other favourite dishes, including lunch and dinner.